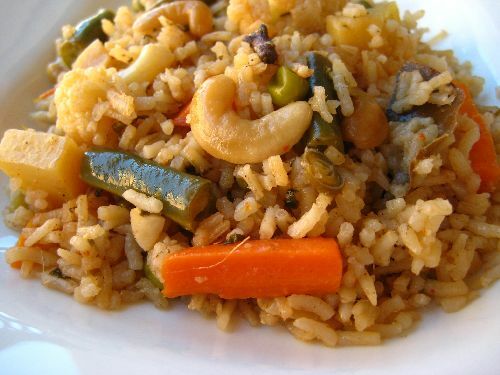 Biriyani is one of the famous foods in India. 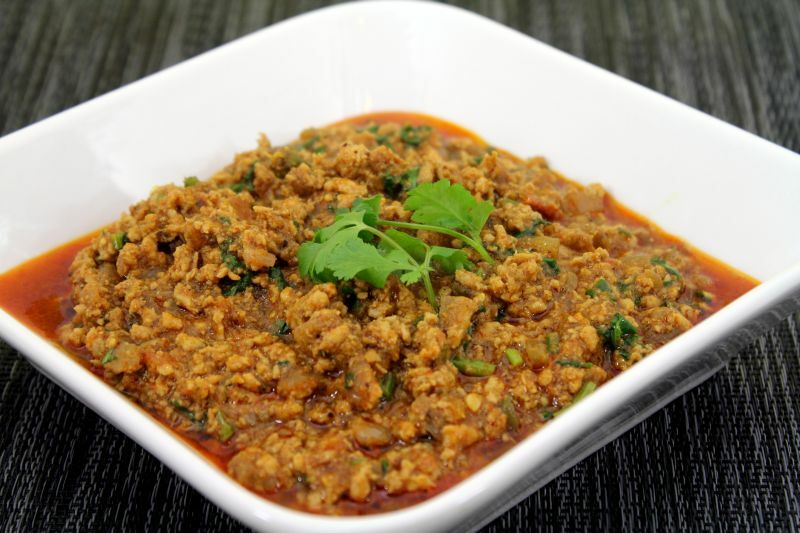 The way of making differs all over India with slight taste variations. 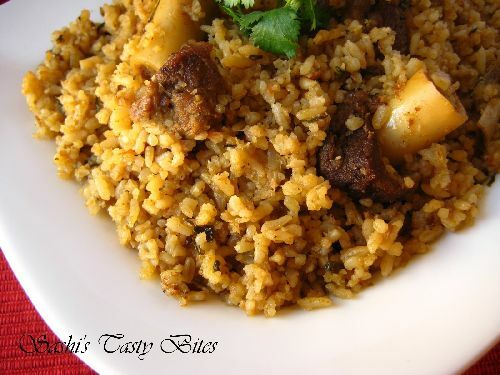 Taste of the biriyani lies in the ingredients added and mainly depends on the order in which they are added. 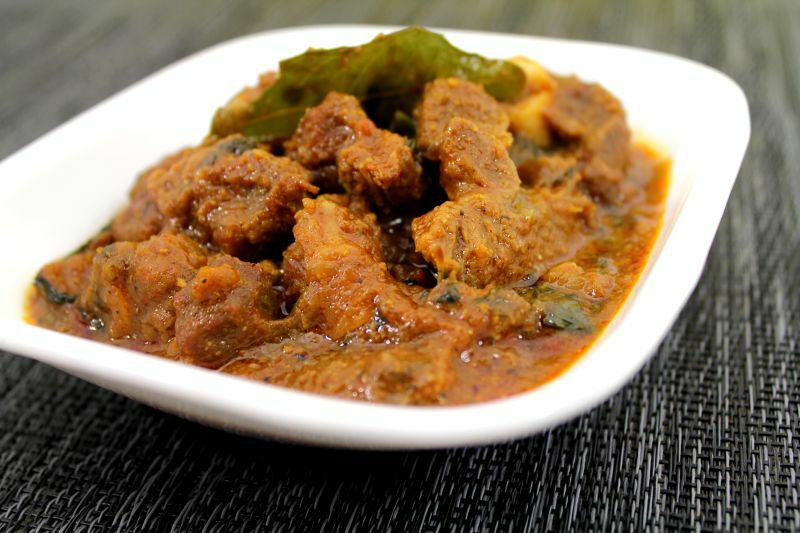 This is a very simple recipe used mostly in the southern state of Tamil Nadu. The same procedure can be used to make Veg, Mushroom Biriyanis taking out the Chicken and related marination stuffs. Taste and Flavor of the biryani comes well when you trial it for more number of times. I added Orange Food Color- 1/4 tsp to get this color. Cut Chicken into small pieces and mix with the ingredients given to marinate. Keep it refrigir for 2 ated for 2 or more hrs or overnight. Grind cinnamon, cloves and cardamom into fine powder. Soak biriyani rice ( basmathi rice) for 10 minutes only. If it's soaked more than 10 min reduce the water quantity while cooking so that the rice doesn't stick together. Chop onion, tomato, green chili, coriander, mint leaves and keep it aside. In a pressure cooker or pan, add oil, chopped onions and fry for a minute. Add garlic paste and 1 tsp or little more of the ground cinnamon powder. Fry till the raw garlic smell is gone. Add ginger paste and fry for few more minutes till a point you don't get the raw smell. Add marinated chicken,chopped cilantro and mint leaves, tomatoes, green chili. Do NOT add water at this point. Water drained from the chicken is enough for cooking. Cook this until the chicken is almost cooked for about 3-5 minutes or add 2 cups of water and allow 1 whistle in the pressure cooker. When done add water, add 1 (cup) : 1¼ (water) ratio. If it was pressure cooked, add only 1 cup now. If not add 3 cups of water. Add rice and check for salt and adjust. Add lemon juice and allow it to boil for 3-4 minutes. Close the pressure cooker lid and allow for 2 whistles. Reduce the flame and leave the cooker for 10 min. If you are afraid of burning the bottom, get an another bigger wider frying pan ( should be bigger than the pressure cooker bottom ) and fill it with water until it's half full. Bring it to boil and keep the pressure cooker inside it and allow it to sit for 15-20 minutes in the low flame. If you don't have the pressure cooker, cook it in conventional oven gives the same result. Preheat oven to 375 Farenheit. Take an aluminium tray or line the oven tray with aluminum foil to cover the bottom. Transfer the mixed rice content to the tray, spread it evenly, cover this tray with an another aluminum foil sheet and seal it properly. Keep this in the oven for about 15 minutes in the middle rack, pull out the oven rack and mix it lightly by opening the covered foil. Add ghee at this point and stir gently as not to break the rice grains. Keep it inside for 10 more minutes. 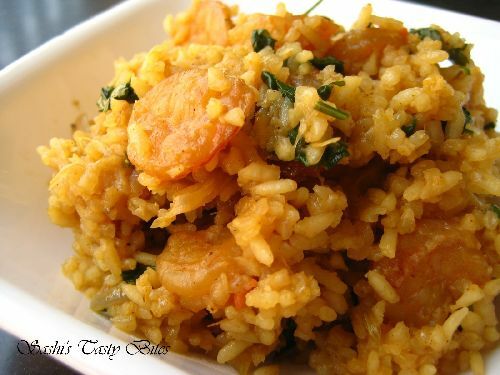 The rice cooked in this method is softer and fluffier. 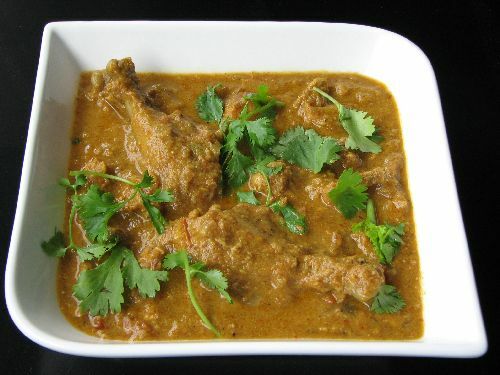 Marinate chicken to get nice biriyani masla taste coated in chicken. Cook chicken nicely before adding rice. This way chicken blends well with the rice. Use the Chicken with bones to get more flavorful biriyani. Grind cinnamon, cloves, cardamom in a large quantity, multiplied with the numbers given and store it in a container. This can be substituted for whole spices in any dish. Always use fresh ginger garlic paste for better taste. Fry them till the raw smell leaves else the taste wont be as you expect. If cooked in a pressure cooker, leave it on stove atleast for 10 -15 min in low flame after the 2 whistles. It gives nice fluffy texture to t herice. Soak rice only for 10 minutes. 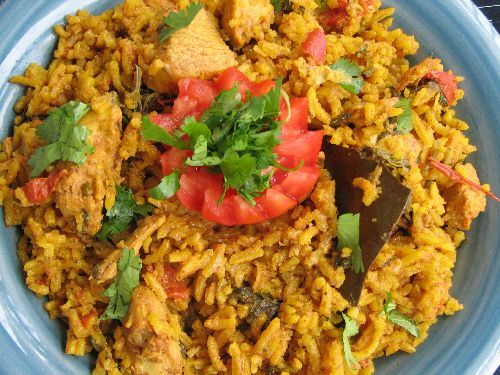 (*) This is a very wonderful Chicken Biriyani recipe from one of my Friends. Serve with Raitha. “When done add water, add 1 (cup) : 1¼ (water) ratio. If it was pressure cooked, add only 1 cup now. If not add 3 cups of water. Add rice and check for salt and adjust. Add lemon juice and allow it to boil for 3-4 minutes. ” – Can you clarify if we need to add 1 cup (if chicken was pressure cooked) or 3 cups of water in addition to the 1 (cup rice) : 1¼ (water) ? 1 cup rice means what? Can you please tell in grams? Baski, I mentioned to add that after ginger garlic paste, however updated recipe with more details. Hope this helps. Wow,amazing recipe. If you are reading this recipe for the first time and have doubts if it will turn out well…I can guarantee you, it will turn out simply superb , provided you follow the steps and the ingredients quantity as mentioned. A must try recipe. Thanks for sharing. Thanks for your posting and tips. I am going to try this today for my daughter’s 14th birthday and I will let you know the result. I am from Tamilnadu but my kids don’t like too much spice. Anyway thanks for your recipe. This was my first ever biriyani…. It came out very well, your extra tips was the reason for that… Thanks a lot…. Your tamil nadu Briyani rocks….this has become my signature dish at home and my husband and my family simply love it…thank you so much…its just a WOW!!! Thanks for you appreciation Sarah, Hope you had fun serving them as well !!! Today I made this biryani and it came out well. My husband liked it so much. Thanks. Liv, “nos” means Numbers (to mention the quantity ). eg. tomatoes-4 numbers. tamil nadu style biryani is a very good dish- we tried it and liked it very much. thanks!